RSVP does not guarantee entry. This event is mixed seated/standing. Arrive early to secure a spot. Will the academy go Gaga for A Star Is Born? Will The Favourite be the favorite? Or will Black Panther‘s Wakanda forever be remembered for being the first superhero film to both be nominated and win Best Picture? 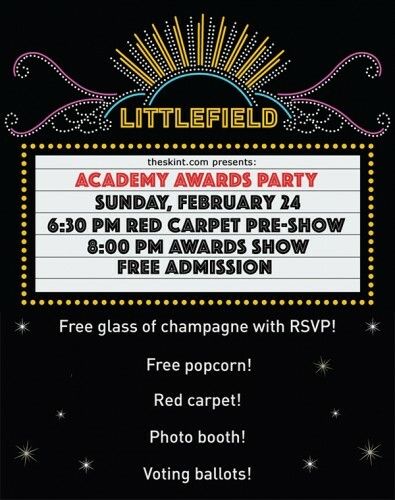 Find out at the skint’s annual Free Academy Awards Screening Party at littlefield on Sunday, February 24! Make your way down our red carpet to the photo booth, talk about your outfit with our fashionista interviewers, settle in with a complimentary glass of champagne (RSVP required – limit one glass per person), and try your hand at predicting the winners with our online voting ballots (most correct picks wins a prize!). We’ll have themed-drink specials and free popcorn all night, and there’ll be food available for purchase from Parklife’s in-house taqueria, El Atoradero. Doors open at 6pm for you early birds, with the official red carpet pre-show coverage at 6:30pm, followed by the awards ceremony on the big screen at 8pm.